"Is my life in danger? Will there be more explosions? Could there be a bomb in some of the cars right here? Can I handle seeing dead people?" freelance photographer Carole Alfarah asked herself as she ran towards a pillar of smoke. Only a few minutes earlier Alfarah woke up to a sound of massive explosion coming from nearby, and now she was confused and running on the familiar streets of Damascus. As a child she took the way to school through this lively residential area every day. Now it was quiet, the streets were empty. Only sirens of ambulances could be heard. Alfarah was exhausted as she reached the shocking scenery of wrecked buildings and burning cars in Qassa'a neighborhood in the capital of Syria. The police were already there, and they prohibited her to make any pictures. 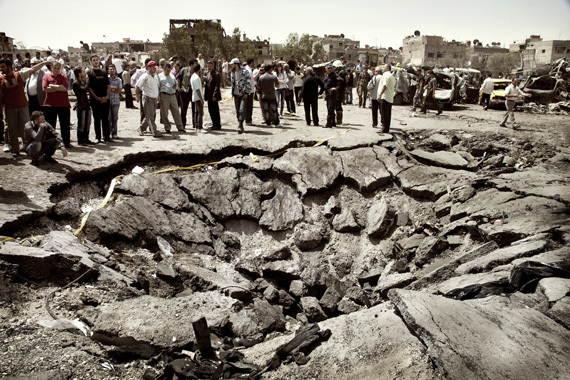 People were examining the scale of destruction in panic. Sounds of exploding gas containers occasionally made their hearts jump. The stench of burned bodies filled the air. Dust was falling down calmly. After about half an hour a number of journalists arrived with reporters from the Ministry of Information, when the police allowed pictures to be taken for a short time. 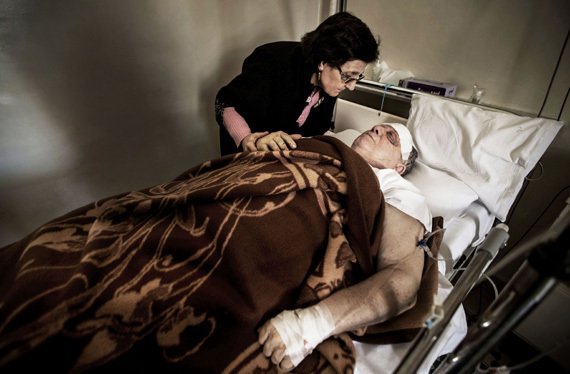 All photography from series After the Bombing by Carole Alfarah. That morning in March 2012 a seed of fear was planted in the souls of all residents of Damascus. It was the first time a suicide bomber had targeted civilians in the Syrian capital. Since that day Alfarah started to document the scenes of attacks on civilians on series After the Bombing. "I am not a war photographer", Alfarah states. "I cover the conflict in Syria because I am Syrian." "When the situation turned into an armed conflict, I focused on people affected by the conflict, people who refused to engage in violence and became victims." The four years of war have cost the lives of over 200,000 people and 7.2 million have been displaced within Syria. Over 3 million people, including Alfarah, have fled the country since late 2011. She moved to Barcelona in December 2012, but has visited Syria several times for her photo projects. In the beginning, the Syrian civil war attracted many foreign journalists and young photographers, some of whom Alfarah also came across. She considers working in Syria extremely tough for all journalists regardless their nationality, although there are some clear advantages for local reporters. "We have so many unwritten rules in the Syrian society, that only a Syrian can know when it is appropriate to take pictures, and when the camera should be put away," she says. "Taking pictures in public spaces is very unwelcome in Syria. It is not like in Egypt or Lebanon where the society is more open to photography and journalism in general." As the conflict evolved to brutal and complex war, Syria became the most dangerous place for journalists to work. From early imprisonments of local journalists, by the order given to Syrian army to "kill any journalist who set foot on Syrian soil," to the recent series of jihadi movement ISIS beheadings of foreign journalists, objective reporting in Syria has become nearly impossible and highly dangerous task. Some media, The Sunday Times and News Agency AFP among others, have announced that they will not accept any material from Syria sent by freelance journalists anymore. Even though Alfarah works within the communities far from front lines, the risks are the same for her. She tries to avoid being killed, jailed or kidnapped by being open and careful with her work. A snapshot could cost a photographer's life. 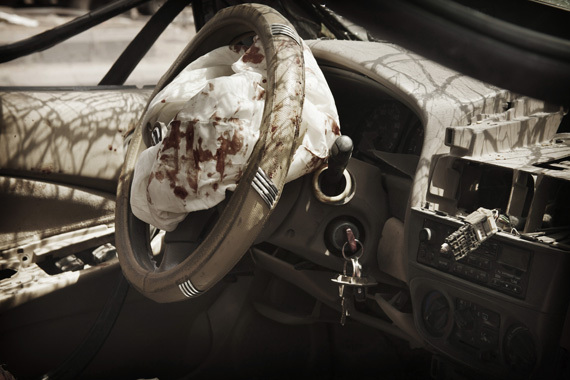 Alfarah has been interrupted or completely prevented from working several times, for example, with the case of the first suicide bombing in Damascus. "Today carrying a camera is like carrying a weapon. Who ever might stop you and start interrogating you for taking pictures." "Every family in Syria got its share of the losses in this frenzy war. I feel hurt, it's like something has been broken inside me." Talking about the incidents is clearly painful to her. Photography is Alfarah's way to protest against the war, hatred and injustice, but it also helps her to process her own fear and sadness amid the general disarray. Alfarah tells that after a few car explosions, all residents of Damascus, including herself, started to constantly dread suicide bombings. It is a terrifying feeling, to know that any moment might be the last one alive. "Right now I can't see the future of Syria, not even imagine it, until the war ends," she says. "I believe that humans are capable of making peace and not only war."